Axisymmetric numerical model has been applied to the analysis of RFEC test phenomena in examination of weld connecting sleeve and main tubes found in nuclear power plant heat exchangers as a repair method for corrosion damaged non-ferromagnetic tubes. Finite element calculations have been used for understanding the interaction of eddy current field with weld between this coaxial tubes as well as for prediction of signal profile of a pick-up coil passing the tested region, for evaluation of differential signal generated by weld-free case, and for selection of testing frequency. Heat exchanger tubes in nuclear power plants, when damaged by corrosion attack have to be plugged if the reduced wall thickness has reached a certain limit. Efficiency of the heat exchanger component gets poor, if too many tubes are closed. An alternative repair method is done by inserting a second tube in order to cover the damaged regions. This inserted sleeve is welded to the first tube by laser beam (see Fig 1). Afterwards, this welding has to be proofed by one of non-destructive techniques. A remote field eddy current (RFEC) technique is one of the newly used method for examining tubes in steam generators. In pipeline inspection operation (i.e. ferromagnetic tubes), this method allows to test both the interior and the exterior surface of the piece (1, 2). One of the limitations inherent in this testing is the low level of the response signal to a test variables when the probe moves along the tube. It is therefore important, the first, to evaluate a possibility to use this technique in some difficult test situations. In order to get a better knowledge of the phenomena and to improve the performances of the RFEC method, the use of a numerical field calculation can provide a good help. Numerical modelling of physical phenomena in testing situations is of significant importance especially for the nuclear industry where high reliability test performance is demanded. In some cases, the numerical process is the only feasible way to analyse the testing situation without interfering noise. The use of model allows it to extend the range of application of RFEC technique to difficult test situations. Current research work is carried out for numerical investigation of the feasibility of the RFEC testing procedure for examination of weld between two coaxial non-ferromagnetic tubes. a key part of this effort is concerned with the use of finite element model for predicting the RFEC probe induced signal (resistive and reactive components). The development of this model and of the related package MagNum (3), is to be oriented towards the NDE modelling. a direct magnetic field: this field is generated by the excitation coil and comes directly to the pick-up coil through the tube. This direct coupling is attenuated exponentially as a function of distance between exciter and pic-up coil. a remote field: the energy generated by the exciter diffuses to the outer surface of the tube wall, travels along the tube in axis direction and diffuses back into the interior of the tube resulting in an attenuation of the magnetic field and a phase shift. Because of different damping, in the vicinity of the excitation coil, the direct field is dominant and far from the excitation coil, the remote field is dominant. For this reason, in a remote field operation, the pick-up coil is placed several pipe diameters far from the excitation coil. In this case, the field measured by the pick-up coil is a field component which has passed the tube wall two times. Therefore eddy currents and the related magnetic field are affected by variations of wall thickness (corrosion), changings in material properties and, of course, in our case the presence of welding connection between two tubes. the probe displacement has to be simulated. The amplitude of the measured fields is some orders lower than in normal eddy current applications, so the experimental set-up has to be sensitive enough. It will be seen below that this small amplitude of the measured voltage in the pick-up coil will dictate our choice of the modelling technique. In order to simulate the physical behaviour of our system, we have to compute the eddy currents inside the tube wall. For this, some assumptions can be made according to geometry - all components of system (two coaxial tubes, exciter and pick-up coils, as well the weld structure) have an axisymmetric geometry. One of the classical complex equations describing the electromagnetic phenomena in axisymmetric geometries was formulated for the magnetic vector potential. The finite element approach we used was a classical variational formulation - the solution of the equation is equivalent to the minimization of the appropriate energy functional (2). The analysis domain includes sleeve tube (with inner diameter 16.6 mm, wall thickness 1.2 mm, conductivity 2 MS/m) inside another one (with inner diameter 19.5 mm, wall thickness 1.25 mm, conductivity 2 MS/m), the gap 0.25 mm between the two tubes, exciter and pick-up coils (each with inner 12 mm and outer 16 mm diameters and length 2 mm) separated by 42.50 mm. all calculations in each investigation series were performed on the same mesh (usually consisting of about 10000 finite elements) with only the materials allocations changing in the welding region, where some of the triangular elements were specified depending on the case as weld or air, and sometimes as tube material. The mesh used in the simulation is very important for the quality of results. In our case, for modelling probe displacement in coaxial tube system with a welding (Fig 1), we imposed a fixed position for the excitation coil and simulated a weld displacement. All the next weld positions were defined and were considered like different "materials" with appropriate values of electric conductivity and magnetic permeability. All these positions were identified by a genetic name. 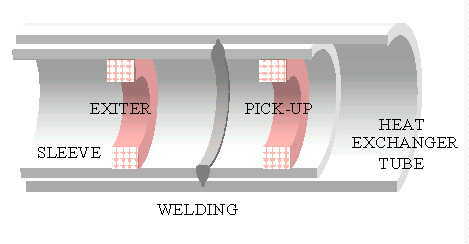 At each iteration of the automatic solution, only one position of the weld was taken into account, while the others were "masked" by modifying the electromagnetic properties of these "materials". A single mesh including all positions or all sizes of the weld , was generated and the different calcuations were made with and without in order to give absolute and relative variations in relation to coaxial tubes without weld. This procedure implied a mesh with bigger number of nodes, but this mesh was made only once for each series. We assume that the pick-up coil is connected to an infinite impedance, therefore, this coil does not modify the flux lines distribution. Thus, its position was not included in the mesh and the flux through the pick-up coil was directly calculated from the solution of equation. Just after automatic simulation, the various possible positions of the pick-up coil and its parameters (dimensions, number of turns, distance from excitation coil) can be defines. The response of the pick-up coil in this case was predicted by moving the weld-model along tubes. The 'weld' was moved a short step of 2 mm from exciter to pick-up coil and the amplitude of induced voltage was recalculated, resulting in a smooth signal trajectory. Such signal trajectories were predicted for various frequencies. Fig 3 shows signal variations versus weld positions, for a fixed relative position (one of many possible) of excitation and measurement coils. Fig. 3: Signal amplitudes versus weld positions for a fixed distance between excitation and pick-up coils. Weld size was varies. Geometric details of the model in this case are shown in Fig 4. In order to improve accuracy and provide resolution in the region of weld, here the mesh density was made high. For illustration of the refinement of the mesh, the regions is shown in Fig 5. The classical flux lines at one time step are presented for fixed weld position and for two different frequencies (Fig 6 and 7). We can notice that the flux lines concentrate around different "secondary" centres in each case, but its perturbation near pick-up coil is not clearly visible. Thus, only the numerical values of flux through pick-up coil can be considered in order to study the influence of the different frequencies. In this case we calculated the differential signals generated by the investigated case taking the signal calculated for a particular weld and subtracting it from the signal obtained for the weld-free case. This differential signal was evaluated for various frequencies in order to determine the optimum frequency for maximum response (which is approximately 7 kHz, see Fig 8). This frequency was selected for the following calculations. Next series of calculations were carried out for welds of different depth of penetration with the step of 0.2 mm up to the complete outer wall thickness of 1.2 mm. In the same way as before, we calculated the differential signals by taking the induced voltage in the pick-up coil for a weld with particular parameters subtracting the voltage obtained for the weld-free case. Signal amplitudes for welds of different penetration are approximately linear for depth up to 70% of outer wall thickness (Fig 9). Fig. 8: Calculated influence of frequency on detector differential signal when detector is near the weld. The results of numerical investigation demonstrate how the RFEC technique can be used for evaluate a quality of welding between two non-ferromagnetic coaxial tubes in heat exchangers. A finite element analysis was used to examine the weld's effect on the induced voltage in pick-up coil. The RFEC response was investigated using finite element software package MagNum. The package is designed to run on a Personal Computer. It was shows that in principle it is possible to detect different depths of penetration for welded connection of double walled heat exchanger tubing. Calculated results are of considerable interest but are not yet entirely satisfying. The two-dimensional case cannot handle variations of depth along the circumference which is, of course, the practical case and a three-dimensional problem. Moreover variations of the gap size between the tubes were not investigated. Considerable work is still to be done before realistic welding shapes can be handled in three dimensions, but nevertheless, these initial results do give an indication of the power of the finite element method to predict RFEC signal.